Le CNRS a organisé en 2003 à Oléron la première école d'astrophysique Pro/Am, suivi par la suite en 2006 et 2009 de La Rochelle. Cette rencontre importante entre astronomes professionnels et amateurs a donné suite à plusieurs rencontres pratiques à l'OHP et au développement par exemple du spectrographe Lhires III. 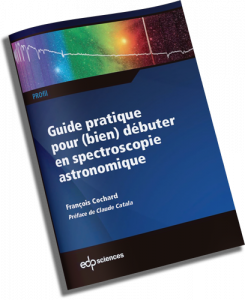 Ce livre, en anglais, est le compte-rendu de certaines présentations, principalement autour de la technique de Spectroscopie, données lors de cette école d'Oléron. The first chapter by Alain Klotz provides an indepth knowledge of the physics of light in the field of optical spectroscopy. Alain is a professional astronomer working on Gamma Ray Burst and is activaly involved in the amateur community through development of AUDELA open source software as well as robotic applications. Christian Buil, a well-known amateur astronomer working professionnaly at the CNES space organization, describes some spectrographs for amateur spectroscopy – the Lhires III high resolution spectrograph beeing on the the equipement developed based on Oleron 2003 outcome! Valérie Desnoux, the famous author of the free software VisualSpec widely used among the amateur spectroscopy community, describes the process of spectral data reduction. Jean-Pierre Rozelot, the organizer of the first Pro/Am school, is providing an excellent review of our knowledge about our Sun and how the study of pressure and gravity waves is giving us information about the interior of the Sun. Coralie Neiner, co-editor of this book and professional astronomer from Paris observatory specialised in Be stars, is providing a key review of non supergiant B-type stars that show emission lines: spectroscopy of Be stars. This field has been particularly active since Oleron 2003 in terms of Pro/Am collaboration. Cometary spectroscopy is decribed in details by Nicolas Biver, a professional astronomer from Paris observatory but also an amateur astronomer sketching comets with his Dobson from his backyard. In this article, Nicolas details the molecules that can be seen in comet’s spectra. This book on Astronomical Spectrography for Amateur is a must-have in your own library!